You may or may not know I recently went blonde and while balayage and golden locks look super cute, they are also extremely high maintenance. Blond hair demands regular toning with purple pigment in order to counteract the brassy tones that inevitably make their appearance after a while. 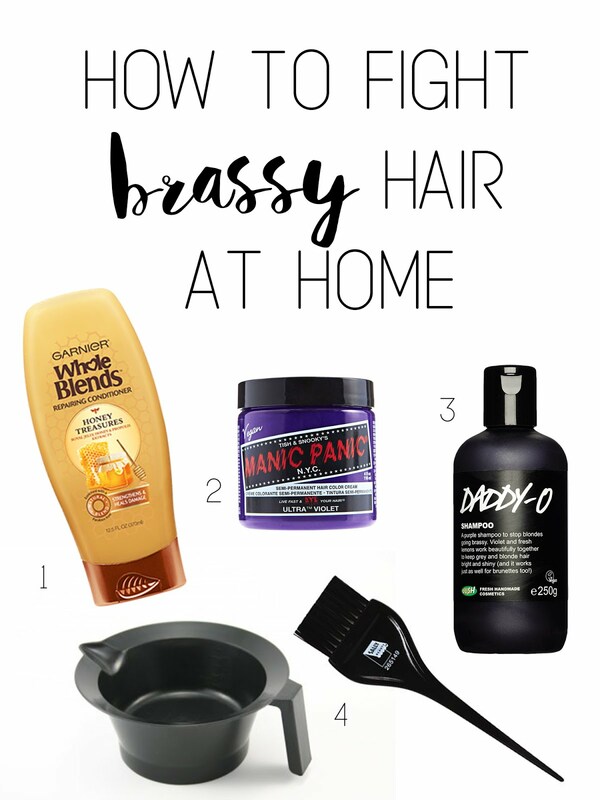 I became a little obsessed with toning my hair to keep it as cool and bright as possible, and found an easy and cheap way to do it at home. All you need is (1) conditioner, (2) a semi-permanent purple dye (I like Manic Panic Ultra Violet), (3) purple shampoo and (4) hair dye mixing bowl and brush. The amount of dye you need obviously depends on your hair length, the degree of toning/brassiness, etc. I have long hair and mix a big blob of conditioner with just enough dye to turn it purple. I usually just barely dip my brush in the dye and mix it with the conditioner in the mixing bowl. I like to do that after I washed my hair on wet hair in order not to wash out the toner with shampoo right away, but you can also apply it to dry hair. I only let it sit for the time it takes to apply it to all of my hair and rinse it out right away. That stuff is intense and will turn your hair lavender in 5 minutes or less. Apply, rinse, that's it. Make sure to wipe your counters and bathtub as soon as possible if the mix gets on them, or it will leave a stain. When I don't use the dye to tone my hair (I only do it about once a month), I use purple shampoo once a week or as needed. This will act as a color booster and will prevent brassiness to settle in and dull your beautiful blond locks. And voilà! No more brass!